Last Edit: 4 years 1 month ago by Ganossa. Thanks to many quick introductions to the ReShade shader language extensions by Crosire I was able to successfully port the first shader which lets me test how easy/hard it will be to port my other shaders. Lets show the progress on pictures. Last Edit: 4 years 2 months ago by Ganossa. Thanks to Ceejay who pointed us yesterday to algorithm that derives normals from depth textures, I did a sample implementation that shows the vanilla picture (left), ReShade + own algorithm normals (middle) and ReShade + enb algorithm normals (right). Both algorithms might be valuable for different things. The binary folder contains the game specific ReShade binary file, the upcoming ReShade_Configurator and the licence/readme files. The ReShade.fx file moved to another folder, more information to this change in the following sections. The GemFX module (by LuciferHawk) comprises all lightning effects and probably also motion blur effects. The McFX module (by Marty McFly) comprises all depth of field and screen space ambient occlusion effects. The SweetFX module (by Ceejay) comprises all color correction and any other cool effects that are not covered by GemFX and McFX. The core folder contains all global resources used by any other shader module. Therefore, the ReShade.fx shader is a shared shader, which combines effects from the 4 effect modules (CustomFX, GemFX, McFx, SweetFX) that are able to share similar variables and samplers. Therefore, only those effects should be shared, which do not use up too many samplers. The new structure of the framework file also allows for custom ordering of any effect in the shared ReShade.fx shader. To enable shared resources and effects, it is necessary to assign specific IDs for naming (e.g. RFX (global), CFX (custom)) to each individual module uses . They contain a <moduleID>_settings.cfg file which allows module specific options and toggling of effects. Their effects are stored in the Shaders folder and are separated into shader and pass files to allow reordering in the shared ReShade.fx file. An 's' indicates that an effect is used in the shared ReShade.fx file. A utility file can further be used to specify values that are valid for most of the shared shaders in a module. The <module_name>.fx file is a not shared shader file which allows more demanding/complex effects to use another 16 samplers. I implemented a conceptual generic sort of eye adaptation algorithm. It will control all lightning effects. "Sort of" eye adaptation because this algorithm can do much more than just the usual mimic of eye adjustments. It is also able to generically detect night/day time and therefore adjust the lightning accordingly. However, so far everything worked out just fine and as always not everything previously done is lost as I can use all newly gained knowledge and advancements in the current DX11 port. The result is a further visually improved ambient light shader (with natural light and god rays). So far the framework maintains the original performance, which -I hope- help everyone to get more attached to it. 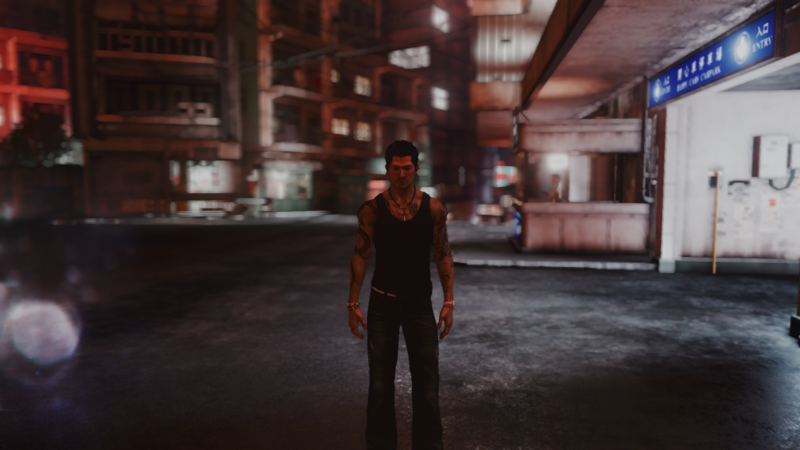 In the following you can see effects from all suites (SweetFX, McFX and GemFX) applied to Sleeping Dogs. Last Edit: 4 years 4 weeks ago by Ganossa. The port also helps with noticing what is important to mention in the developer tutorial. We are almost there guys and gals. The framework implementation is done and we run the last few checks. My first AL implementation made it barely into the framework (for the other one I need a little more time). As planned, I continued working on my eye adaptation algorithm which was already (partly) introduced with the current releases of my ambient light shader. However, there have been some issues that made it not as effective as is should have been. Therefore, I changed parts of the previous algorithm (now plus exponential dependencies) and also added true eye adaptation based on the original image in conjunction with ambient light adaptation (they kind of balance each other). I hope later today, I can give you a short showcase on how it works/looks. On the top of the screen you can see the light detected by the eye adaptation algorithm (orange) and the -by the algorithm- selected adaptation amount (green). Note that I did not use any color correction in this video. Due to AL's eye adaptation, one could say AL replaces the original lighting. Further, eye adaptation is a good way to keep the brightness of some games in check (especially when applying more effects). Last Edit: 4 years 1 week ago by Ganossa. Some improvements on the algorithm in motion. If it gets better like this, I might be able to release something with the next update? Last Edit: 4 years 2 weeks ago by Ganossa.